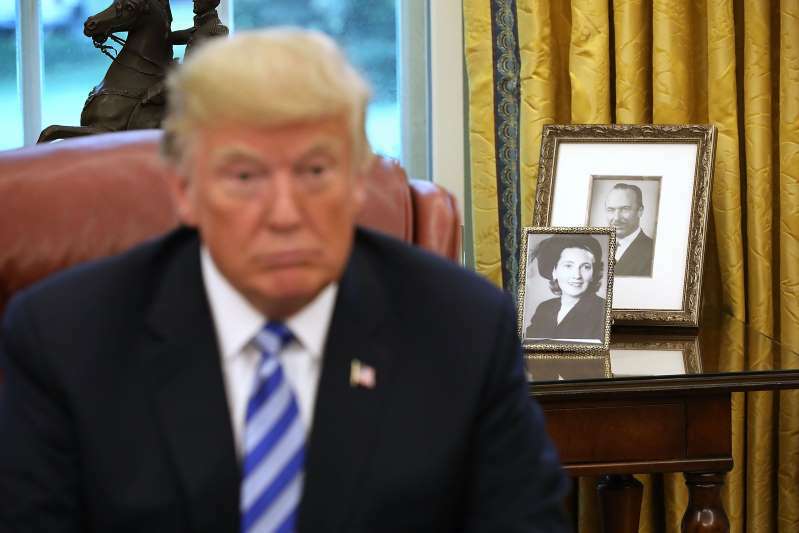 © Chip Somodevilla/Getty Images President Donald Trump and photographs of Fred and Mary Trump. In the waning days of the 2016 presidential election, we learned that Donald Trump lost nearly $1 billion in a single year. This peek into his tax situation led his opponent Hillary Clinton to charge that Trump was refusing to release his tax returns because they’d show he didn’t pay any federal income taxes. Does paying no federal taxes make Trump the smartest tax guy in the room? That depends on what being smart about taxes implies. If it’s legal tax avoidance, that’s OK, but if it’s illegal tax evasion, that’s not OK.
Is Trump smart or just a tax con man? Tipping the scales toward being smart is that despite the bombshell accusations reported, there has been little public outrage. All joking aside, Trump is now president of the United States, and it seems that our president shouldn’t be a tax dodger. Taxes, after all, are what we pay for a civilized society. So, what “smart” tax practices did the Trump family pursue? One is the estate tax-minimization vehicle called a Grantor Retained Annuity Trust, or GRAT. These trusts, which are totally legal, allow people with large estates to shelter them from tax. Frankly, I work hard and if I managed to accumulate a taxable estate worth say $50 million, I wouldn’t want to send $20 million to the federal government. I’d rather give it to my kids or to charity. Wouldn’t you? The Times didn’t find fault with the Trumps' use of GRATS. Instead, the newspaper charged that they “dodged hundreds of millions of dollars in gift taxes by submitting tax returns that grossly undervalued" the real estate assets they put in their parent Fred and Mary Trump’s GRATs. For example, even though the properties sold for $900 million a few years later, Fred Trump’s 1995 gift tax return said they were worth just $41.4 million. That’s a huge tax dodge. And the tax authorities noticed, finding on audit that the properties were worth $57.1 million. The Trumps low-balled the valuation, figuring that although the IRS has rules for determining fair market value, they weren’t likely to be challenged. Of course, playing a “catch me if you can” game with the IRS has severe consequences for the ability of the government to raise the funds needed to pay for things such as Social Security. And playing the audit lottery can be risky. Suppose you were about to face an IRS audit? Would the tax strategies that you employed pass muster with the IRS? GRATs are so popular that Richard Covey, the attorney who identified their potential for minimizing estate tax liability, has been recognized for his brilliance in developing “exciting estate planning techniques” by none other than the American Bar Association. However, that tax “legend” later had second thoughts about what he created. “You can certainly say we can’t let this keep going if we’re going to have a sound system," he said in 2013. One question we might ask about Trump’s tax avoidances and evasions is, “Do we really care?” It turns out that we do. Surveys show that we don’t think it’s morally acceptable to bend the rules to reduce our taxes. We also don’t even particularly like these “smart” tax-avoidance schemes. An April Gallup poll shows that more than six of every 10 Americans say upper-income people pay too little in taxes. If anything’s going to make us mad about Trump’s tax planning, it’s that he bends the rules. So, is Trump the smartest tax guy in the room? He’s smart in finding the weaknesses in the tax code that provide legitimate tax breaks. But he’s not smart in exploiting weaknesses that allow “tax dodging.” The only way to truly know whether he is the smartest tax guy in the room is to see his tax returns. Politics - U.S. Daily News: Is Donald Trump smart on taxes, or a clever tax con man who committed 'outright fraud'?